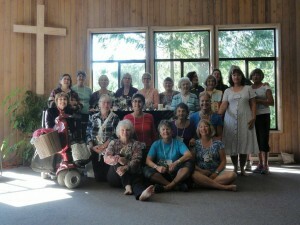 This year at our annual retreat at Bethlehem Centre, Nanaimo, we were invited to experience a transition ceremony into Crone, woman’s third stage of life. Of the 23 women registered, eleven of us took advantage of the opportunity to acknowledge this important stage of life where experience and wisdom gained throughout our lives are passed on to others as we mentor other, younger females. 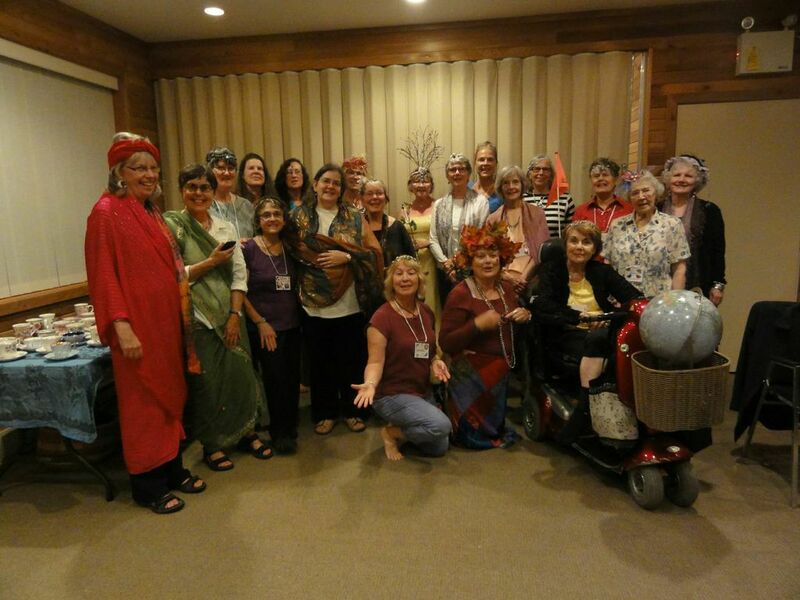 On Saturday afternoon we each created a “crown”, all of them beautiful and unique, to wear in the ceremony. 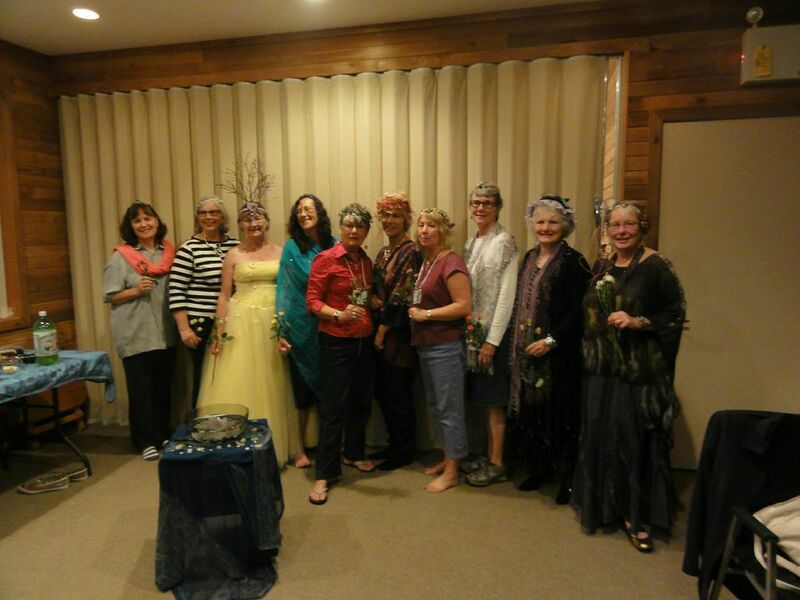 We dressed ourselves in various attire according to individual tastes and desires, presenting ourselves in outfits ranging from a strapless, multi-crinolined gown and other fine evening wear to casual, comfortable wear, often draped in colourful scarves and shawls. There was a festive,almost giddy atmosphere as we gathered outside and took photos. Upon entering the room for the ceremony, we were “birthed” into a quiet, almost solemn space of low lights. In each corner was an alter, draped in the colour of and displaying artifacts corresponding to the element representing the four directions; East for air, South for fire, West for water, and North for earth. There was also a woman at each alter dressed as the representative element to welcome each of us at the conclusion of the ceremony. As our names were spoken, we were caped and asked to invite the women who had mentored us and the maids and women we promised to mentor. 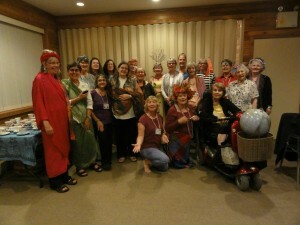 After the cape was reversed we were welcomed as crones by all the other women present. This, for me, was the most powerful part of the ceremony. We have all experienced many transitions in our lives. Some, like our first menstrual period, may have been unremarked except for being handed supplies. Others, like birthing a child, may have been dramatic, powerful and spiritual and celebrated in special ways but it was usually focussed on the child. I am very happy that I had a chance to celebrate this time in my life when I have turned 65 years old and also have recently retired. It gave me an opportunity to thank the women from my past who helped me become the woman I am and to be mindful of my responsibility towards the females in my next two generations. I am very grateful to all the women at the retreat and especially to Betty Donaldson for creating and conducting this meaningful and beautiful ceremony with such grace.